The monsters are here... and they're so hungry. Hungry... for... your delicious, magical cooking!! 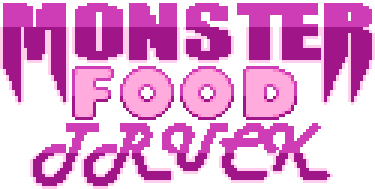 Play as the witchchef owner of the wonderful Monster Food Truck and, with the help of your fridge-mimic, craft delicious food for your monster customers! 1) Move Flavor Blocks around the board and match 2 or more with your pot to get an Ingredient! 2) Look up at the menu for the day and make the Ingredients you need to make one of your delicious Dishes! 4) A finished Dish will shoot off the grill, just go grab it and serve it to your wonderful customers! 2+ Flavor Blocks stuck in the pot! 3 correct Ingredients on the grill! 1 delicious Dish for your monstery customers! Try and get as much money as you can! The more Flavor Blocks you clear at once, the bigger your tip! If you have any questions, concerns, or just wanna tell us what you thought, let us know on twitter! Download, unzip to desired location, and enjoy!